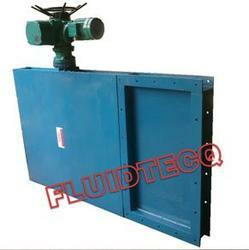 Slide gates at FLUIDTECQ are made with utmost accuracy and are very reliable. Our engineers design valve after collecting all technical information from the clients – hence each valve offered to the client is exactly suitable to the application. Full bore opening offering free flow of product without any restriction. Ideal for dry bulk solids like powder, grains, pellets. No Jamming of any parts. Manufacturing at FLUIDTECQ is a well planned process followed by appropriate quality control and inspection. Timely upgrading of machines, calibration of measuring instruments, documenting minutest of details for analysis and improving is an everyday affair. We offer an extensive range of Pneumatic Slide Gate. These slide gates are the best choice for handling dry material in gravity flow or low-pressure applications. This gate is available in a wide variety of configurations including rectangular sizes and customer specific hole patterns. Our Slide gate valves are designed to shut off product flow from outlets of storage bins, silos, conveyors, and other discharge points handling dry bulk materials.The valve frame is constructed from ISMC sections with a hardened ground blade which rides on cam rollers or solid guides. Actuation of slide gate valves is accomplished by using Electric multiturn actuators for precise positioning. Blade seals are selected according to the material being handled and are available to suit any application. 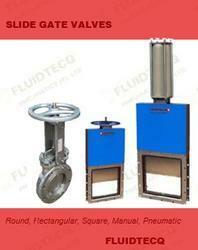 FT offers a large selection of slide gate valves from 4 inches square up to 30 inches square. Slide gates are also available in sizes larger than 30 inches, rectangular, and special configurations as per the customers requirements. Packaging Details: Special Wooden Packing with 3 tier thermocol and bubble wrap packing. Maintenance Slide gate Valve is designed to isolate material from SILO/Hopper/Container/Mixer. The heavy duty gate cuts through most solid/semi-solid material. Handwheel / Chain wheel / Lever crank mechanism are provided. Packaging Details: 3 tier packing - bubble pack + foam sheet in export worthy wooden boxes. Looking for Slide Gate Valve ?